Mid-week clean and linen change. An excellent family trullo... for one family or two! Trullo Selva is a newly renovated group of trulli that has been transformed into an extremely comfortable villa for up to 8 guests. Situated on a plateau dominating the Valle d'Itria and the Adriatic coast of Puglia, it is also conveniently situated for exploring the Salento peninsular… unless you just want to rest, that is… in which case the pool should come in handy! ⁵ why not organise for a "pizzaiolo" to come and make your pizzas for you? Inside: accommodation at Trullo Selva is spread over two trulli: Trullo Pietra has a kitchen with a large dining area and a sitting room. It also has a double bedroom with en-suite shower room, and a double-twin room with an adjacent family bathroom with tub and shower attachment. 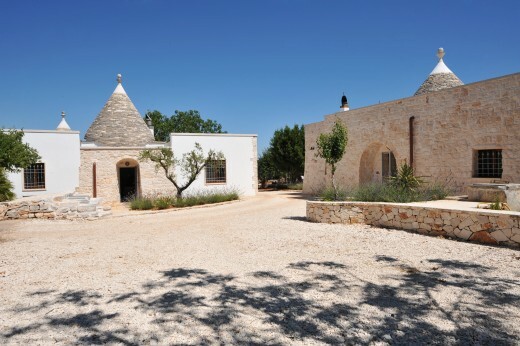 The second trullo, Trullo Bianco, also has a fully equipped kitchen, a living room, a double bedroom with en-suite shower room and a double-twin with an adjacent family bathroom with tub and shower attachment. Both trulli have been restored to a high standard and offer very comfortable accommodation. Outside: the trulli are set around a private courtyard and have ample shaded areas for eating and relaxing outside. Three acres of garden dotted with olive and fruit trees houses a raised pool (giving swimmers better views!) surrounded by decking. An ideal summer house for one or two families. Trullo Selva sits at about 400m above sea level just outside the small town of Selva di Fasano in the the rolling Puglian hills. It also has one restaurant within walking distance. The countryside is dotted with centuries-old olive groves producing some of the world’s finest olive oil, and several picturesque towns and villages. The nearest towns of Alberobello (a UNESCO Heritage Site thanks to its wonderful trulli-laden centre), Cisternino, Locorotondo and Ostuni all offer plenty to see, regular markets, as well as a selection of typical bars and trattorie. One of the attractions of Trullo Selva is undoubtedly that guests may enjoy stylish beach clubs, golf courses and spa nearby. World class sites nearby include the Baroque centre of Lecce and the stunning walled coastal towns of Otranto and Gallipoli. All are within easy driving distance. "Trullo Selva was excellent - everything you could possibly need was provided. Good location. Excellent service and really appreciated having plenty of essential items." Trullo Selva is beautiful, really well equipped and good value. We had a really relaxing holiday. Our holiday was perfect! We had all we needed at Trullo Selva and every day care from your team - you are wonderful! We had a really well organised and relaxing trip. Trullo Selva was even better than the photos. The whole trip was just amazing. The two ladies that came and cooked were lovely and efficient, and cooked the most amazing meal, we will never forget. We loved the layout of the property, the different areas where one could retreat and the location of the property - so close to all those beautiful cities. We had a wonderful experience and thoroughly enjoyed our stay at Trullo Selva. We really loved everything about this holiday and will definitely be going back to Puglia. A week in the villa was just not long enough! Overall this was one of our best family holidays ever! Trullo Selva was excellent - everything you could possibly need was provided. Good location. Excellent service and really appreciated having plenty of essential items eg toilet rolls, kitchen towels, dishwasher tablets etc. Food provided in welcome basket excellent. The villa was lovely and very well equipped. The pool and facilities were fab! Fantastic setting; suited us very well, having two houses, beautifully fitted out and with excellent facilities and equipment - down to firewood and umbrellas - which we needed!! We loved it. Our villas were perfect for two families travelling together who still want their own privacy. The villa was lovely and we really enjoyed ourselves. Wine delivery was excellent and the wines were of good quality. Appreciated the fact that there were screens on all windows and doors as it is lovely to be able to have doors/windows open without worrying about mosquitos. We had a wonderful time!! There are so many things to see, also with kids! We could visit the area even with our small kids and we could enjoy the nice villa where the kids could have their naps too! We had a lovely relaxing break & the property is beautifully renovated in a lovely setting. Excellent accommodation in a great location, perfect for visiting all local highlights. Would we recommend The Thinking Traveller? Without hesitation - well done all! A wonderful villa: much loved by us all. What did we enjoy most about visiting Puglia? The villa and facilities. The peace and quiet, and beautiful night skies. A wonderful villa if you like to cook as very well fitted kitchen.